Here is a layout I made with Ellie's portion of the Sunshine Girl's easter treats. The colours were perfect. This is my daughter with her pre-school easter bonnet parade. We had been asked to make Easter Bonnets for the day after St Patricks Day, when we had to send them in something green. Because really we have nothing else to do but make costumes ! Anyway work and life in general are crazy at the moment, so I "outsourced" the bonnet and bought one at Spotlight. I see it as my civic duty to stimulate the economy LOL. The easter egg hunt at the sunshine girls was just fantastic, easy to follow and gorgeous colours and designs. I've said it before but I just continue to be amazed and humbled by the generousity of the digi scrapping community. Ericka, this layout turned out so amazing! 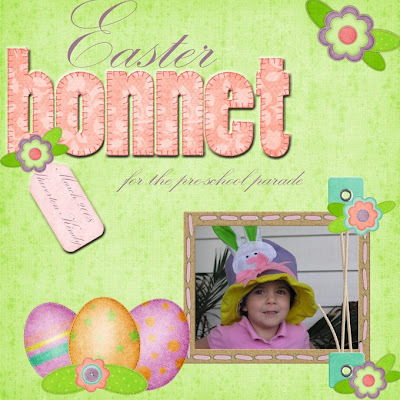 And your daughter is just so adorable in her Easter bonnet! How totally cute is she!! Your "Bargara Dreams" kit is gorgeous!! Thank you so very much for sharing all these lovely parts. I'm happy Vicki directed me to your blog. Erika - love the layout! Thanks for your comment on my blog! I have no idea how to make a blinkie - I will look into it and see if I can figure it out! Wish me luck!